This year’s theme, "Connecting Classrooms to Careers" helps connect learning to applications in science and STEM related fields, from the early childhood years through High School. Our keynote and sessions will support you with inspiration, strategies, and resources to support this theme in your work. Congratulations 2019 AMC 10/12 Winners! Science Math Resource Center administered the competitions at Bozeman High School on Thursday, February 7 and at Montana State University Campus on Wednesday, February 13, 2019. The AMC 10/12 provides an opportunity for high school students to develop positive attitudes towards analytical thinking and mathematics that can assist in future careers. The AMC 10/12 is the first in a series of competitions that eventually lead all the way to the International Mathematical Olympiad . Congratulations 2018 AMC 8 Winners! In addition to these prizes, SMRC will award $25 one other top performer in 5th grade Ryan Loftsgaarden (Morning Star Elementary School) for the outstanding score at his age. Junior high and high school students from across Montana competed in team events that tested their knowledge of various sciences, concepts and practices. A total of 117 teams competed, including 60 Division B teams, which are made up of students in sixth through ninth grades, and 57 Division C teams, which are composed of students in grades nine through twelve. Science Math Resource Center hosted the 2018 American Mathematics Contest 8 (AMC 8) for all middle school students interested in mathematics at Sacajawea Middle School and Chief Joseph Middle School on Tuesday, November 13 from 4:15 - 5:20 pm. AMC 8 is a great warm-up competition for MATHCOUNTS students. First Place $100, Second Place $75, Third Place $50, and $25 "Youth Prize" to the top performer in 6th grade or below. Middle school and high school students from across the state are preparing for science, technology, and engineering events. More information can be found. Science Math Resource Center organized a Workshop on Engineering Design for K-5 Classrooms. This was a wonderful hands-on learning opportunity for participants on the basics of engineering design and how to incorporate engineering activities into the elementary classroom. Participation includes 12 OPI renewal units, travel expense reimbursement, MSU dorm room equivalent housing costs, and per diem. For more information about the workshop, contact Ehsan Salam at the Science Math Resource Center, ehsan.salam@montana.edu, 406-994-3733. 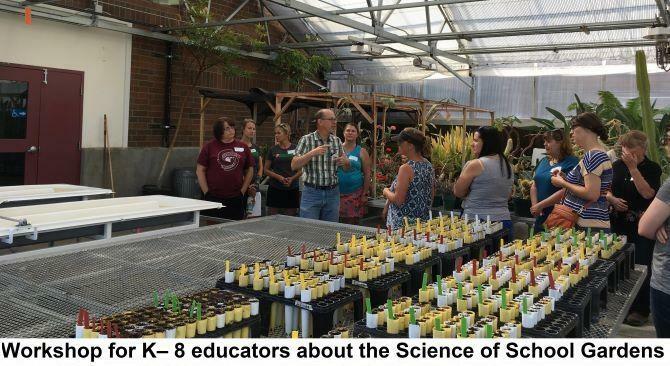 Science Math Resource Center organized a Summer Workshop for K– 8 educators about the Science of School Gardens in collaboration with Gallatin Valley Farm to School and Farm to School of Park County. This was a wonderful hands-on learning opportunity for teachers on the basics of planning, planting and maintaining school gardens, greenhouses and aquaponics systems. Montana State University’s Science Math Resource Center (SMRC) organized the 2018 American Mathematics Contest 10/12B (AMC 10/12B) at Bozeman High School on Wednesday, February 15, 2018. Eligibility: Students in grades 10 or under for AMC 10B OR grades 12 or under for AMC 12B. 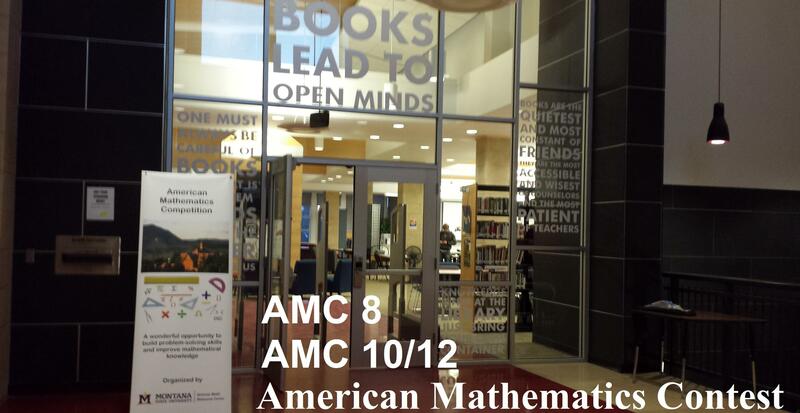 2017 AMC 8 offered through MSU's Science Math Resource Center and sponsored by the Mathematical Association of America. The American Mathematics Contest 8, hosted by Sacajawea Middle School in November 2017. Twenty six local students from grade 5 through 8 participated in the contest. The average score for the group was 8.1; our highest-scoring student achieved 18. On a national level, AMC awards the designation of ‘Distinguished Honor Roll’ to the top 1% of test takers; on this exam, that was a score of 20 or greater. The ‘Honor Roll’ or top 5% scored 17 to 19 points. Top 50% scored 8 and 75% scored 6 points. One Bozeman Student achieved a position on an Honor Roll this year. Thanks go out to all the wonderful Montana Science Olympiad Volunteers who made the 33rd annual MTSO Tournament a success!! We could not hold the tournament without your generous contributions of time, knowledge, and talent. Hope to see you volunteering next year! The 33rd Annual Montana Science Olympiad state tournament was held in Bozeman, MT on Tuesday, November 21, 2017. There were 57 Division B teams (grades 6-9) and 51 Division C teams (grades 9-12). Specific Division C and Division B results can be located HERE. Science Math Resource Center at Montana State University organized a Summer Workshop for K– 8 educators about the Science of School Gardens. This was a wonderful hands-on learning opportunity for participants on the basics of plant growth and gardening. The Participants have learned how to establish a school garden and incorporate math and scientific concepts in design, build, harvest and sustainability. The two-day workshop enrolled 20 in-service teachers, and runs the morning of Wednesday August 2nd through afternoon on Thursday August 3rd. Participation includes 12 OPI renewal units, travel expense reimbursement, dorm room or equivalent housing costs, and per diem. The 32nd Annual Montana Science Olympiad state tournament washeld at Montana State University in Bozeman, MT on Tuesday, November 22, 2016. There were 50 Division B teams (grades 6-9) with 604 students and 46 Division C teams (grades 9-12) with 555 students. A total of 77 Montana schools fielded teams for Montana Science Olympiad! 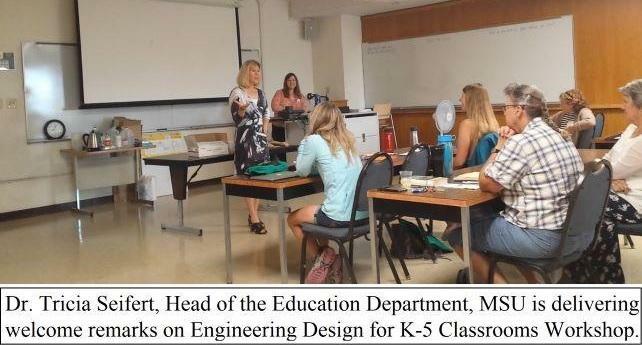 The MSU Science Math Resource Center hosted a summer “teaching engineering” workshop in Bozeman for teachers of grades K-8. The workshop was led by an engineering professor and teachers who participated in developing the curriculum and in revising it based on their experiences implementing it in their classrooms. The workshop immersed participants in NGSS- and CCSS-aligned engineering activities for grades K-8, taught the engineering behind the activities, and made curriculum connections to science, mathematics, art, and English Language Arts. Most of the engineering activities used commonly-available classroom materials, making this an affordable entrée into engineering. The workshop leaders shared examples of children’s work on these activities from their classrooms. The curriculum focused on physical science and engineering, and the materials can be integrated with nearly any subject in the elementary grades. Middle school teachers interested in exploring ways of integrating engineering across subject areas will also find the curriculum relevant. Break-out sessions on the third day allowed participants to focus on early elementary or late elementary/middle school implementations. The workshop used engineering activities grounded in science concepts of force & motion and energy that integrate mathematics, English Language Arts, and art (for example, Wind-ups http://www.citytechnology.org/sara-and-lolas-wind; Pop-ups http://www.citytechnology.org/unit/pop-ups; and Invent-a-Wheel http://www.citytechnology.org/invent-wheel). The 2015 Montana Science Olympiad was held on November 24, 2015. 1,102 students on 47 Division B teams and 41 Division C teams from 81 schools in Montana competed in a variety of events at Montana State University. During the Fall of 2013, we conducted a needs assessment survey of K-­-12 science, technology, engineering, and mathematics (STEM) educators in Montana. The primary purpose of the survey was to identify the educational needs of K-­-12 formal and informal STEM educators and collect information about schools or organizations that could be relevant to the implementation of teacher enhancement programs. The survey was completed by 213 STEM educators from 42 out of 56 counties in Montana. Eggs falling from great heights? Unraveling a mysterious disease? Launching gliders? All of this happened at the annual 2013 Montana Science Olympiad hosted by MSU’s Science Math Resource Center on Tuesday, November 26, at MSU-Bozeman campus. 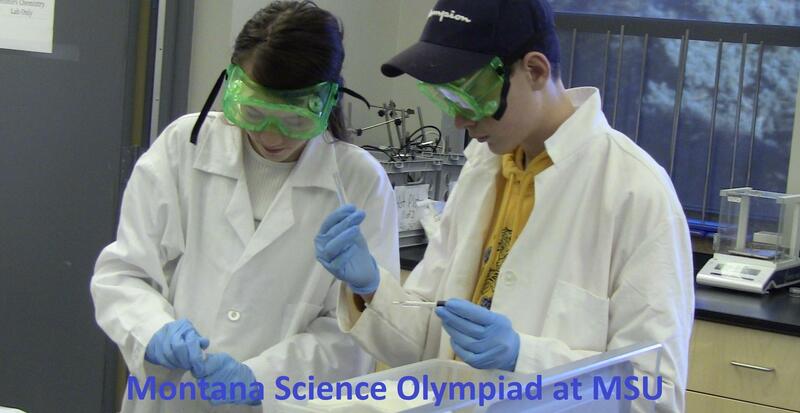 Roughly 1,400 students from 94 middle and high schools throughout Montana participated in the 2013 Montana’s Science Olympiad. The competition included twenty eight events related to science or engineering such as: building a cantilevered structure, identifying insects, constructing magnetically-levitated vehicles, identifying rocks and determining mineral hardness, and data analyses using the principles of genetics. Teams competed in either middle or high school division events, and the winning team of each division has the opportunity to participate in the national tournament, to be held on May 16-17, 2014 in Orlando, Florida. This year, thanks to donations from members of the Bozeman community and the Montana Science Olympiad, the auditorium of the closing ceremony trembled with roars of joy when winning teams received $1,500 each to help with the expenses required to journey to Nationals. In addition, second-place teams received a gift from the Montana Space Grant Consortium (MSGC) to attend the 2014 MSGC Student Research Symposium to be held on Monday April 7, 2014 at MSU-Bozeman. The Montana Science Olympiad is much more than a competition; it is an invitation to be immersed in the world of science and engineering in a fun and engaging way! A Fun Night launches the Montana Science Olympiad on the Monday evening prior to the tournament at the Museum of the Rockies. This year, 553 participants, including Olympians, coaches, and parents from 28 different schools in Montana, consumed 831 square feet of pizza, engaged with presenters and participated in activities.Thanks to Angela Weikert –Museum of the Rockies Education Director- and presenters, Montana Science Olympiad participants celebrated science with magic, Planetarium shows, live animals, hands-on activities, and impressive demonstrations of robotics, space engineering, architecture, anthropology, astronomy, and chemistry. The exhibits were open to the public, and as a parent said “ MOR is better than the Smithsonian museums in D.C.” in regards to the quality of the exhibits and programs. 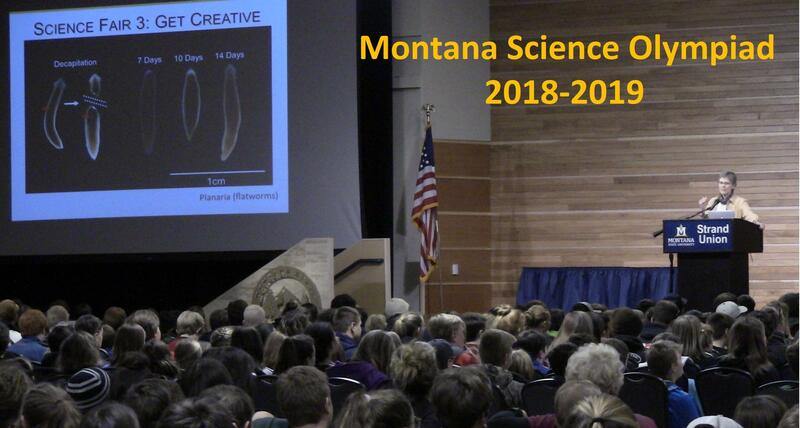 At the 2013 Montana Science Olympiad, Olympians, coaches and parents had the chance to attend some of the 14 talks and tours that showcased cutting-edge research at Montana State University. Subzero Lab, High Altitude Balloon Lab, and Neuroscience Lab tours were packed with public eager to visit the facilities that make it possible to reach new frontiers. The physics of skis, sustainable agriculture, MSU Everest Expedition, honey bees, NASA’s new solar missions, how to train your robot, and turning scientists into filmmakers were some of the many talks that the audience enjoyed. All of the activities, presentations, and events of Montana Science Olympiad resulted from the collective effort of about 100 volunteer MSU faculty, students and Bozeman community members. Their efforts plus the committed work of the Science Math Resource Center staff including: Bruna Irene Grimberg, Montana Science Olympiad State Director, Kiley Eversole, Montana Science Olympiad Coordinator, Jesse Hunter, Montana Science Olympiad Administrative Coordinator, Annie Mollock, Science Math Resource Center Administrator, and Sarah Hendrikx, Science Math Resource Center Data Analyst made this year’s Olympiad a great success. Thank you Bozeman and MSU communities for your dedication and passion, it really makes a difference in the future of Montana and our kids! On October 17th, the Science Math Resource Center was happy to be honored by the Montana Science Teachers' Association at the MEA conference held in Belgrade, Montana. The Science Math Resource Center received an award from MSTA for "Superior Achievement in Science Education for 2013" for qualities of innovation and creative teaching, content expertise, enthusiasm and leadership, which contribute to excellence in promoting science education in Montana. Science Math Resource Center: Making Science Fun! Annie Mollock, Jesse Hunter, Kiley Eversole, and Irene Grimberg represented the Science Math Resource Center and the Montana Science Olympiad at the Montana Science and Engineering Festival held on September 21 at Bobcat Stadium. In an effort to publicize the Montana Science Olympiad to the community and engage the public in science and engineering we had hands-on activities and flyers that explain what the Center does for STEM education in Montana, and volunteer opportunities offered by the Montana Science Olympiad. 235 people visited our booth to play with magnets, decipher optical illusions, and explore the intricacies of mass and inertia. The activities were very well received, and adults and kids both had fun. Teachers of the area requested resources for their classrooms, and many MSU students pledged to volunteer for the Montana Science Olympiad, on November 26 at our very own MSU campus! In addition to the Montana Science Olympiad booth the Science Math Resource Center along with faculty of Plant Science and Plant pathology, Land Resources and Environmental Science, College of Agriculture, and MSU-Extension had a booth to disseminate their research on integrated pest-management in crops. Together, we have a number of USDA grants to investigate multitrophic pest interactions and cropping system management. The Science Math Resource Center is in charge of the educational component. At this booth sheep and microscopes greeted visitors and even children played virus and cells in a virus-tag game!! Family Fun, Food, and Learning Night: Better than Christmas!! There is vast research supporting the idea that reading and parental engagement in school activities are critical factors to facilitate students' learning in ALL content areas. Moreover, reading or being read to during the summer months is very important to enhance or retain students' literacy level. Any reading material, and reading in any way -picture or text based books, and doing hands-on activities- is beneficial. The important thing is that students pick their books! The Science Math Resource Center in partnership with Hopa Mountain organized a powerful and transformative educator training to engage school students and their family in a Family Fun and Learning Night program. Dr. Bonnie Sachatello-Sawyer, Hopa Mountain director, led the training focusing on: how to implement this family learning program in a school, storytelling and reading aloud-techniques, exploratory science-activities, and give-away books to children. Bonnie modeled a rock sorting activity inspired by the book "If You Find a Rock" by Peggy Christian and Barbara Hirsh Lember. Then teachers examined different ways to use this activity in their classroom, not only to address science content but also to reinforce reading comprehension and explore mathematical concepts. A picture astronomy book "There's No Place Like Space" by Tish Rabe and Aristides Ruiz was introduced along with night observations and recording of moon phases. Ideas to extend this hands on-reading aloud activities to parent conference settings or school family nights, such as Astronomy Night and Science Night, were also discussed. The teachers received lesson plan packages for the rock and astronomy programs with descriptions of activities for students, parents and students, tips for parents for reading aloud and literacy activities at home, a book list. The training concluded with teachers picking books for their classrooms and their students including: rock books; books about the moon, night sky, and Sun; books about Spring, about dogs, and many more!! If you want to receive the activity packages and /or the books please visit the Hopa Mountain website, or e-mail Bonnie: bsawyer@hopamountain.org. If you need assistant and ideas to implement these activities in your classroom, or during parent conferences or family nights please contact the Big Sky Science Partnership teachers: Tanya Anderson (Hardin Intermediate), Devon Flamm (Hardin Intermediate), Reba Strom (Hardin Elementary), Dorcella Plain Bull (Pretty Eagle), and Michelle Jefferson (Pretty Eagle).